Horbury Junction has since Victorian times been a heavily industrialised part of Horbury. It was named after the railway junction there and covers an area of 1,163 acres. The start of the industrialisation began in the early 1870s with the construction of Millfield Mill, followed by the Horbury Ironworks Co. In 1873, Charles Roberts bought a site for a new factory at Horbury Junction and moved his wagon building business from Ings Road, Wakefield to Horbury Junction. Before that, the area of Horbury Junction was a quiet backwater with a corn mill and a ford across the Calder for farm traffic. In reality, a beautiful pastoral area of countryside was changed forever with the coming of the Railway, Millfield Mill, the Wagon Works and the Ironworks. The Charles Roberts story is covered in a separate chapter. 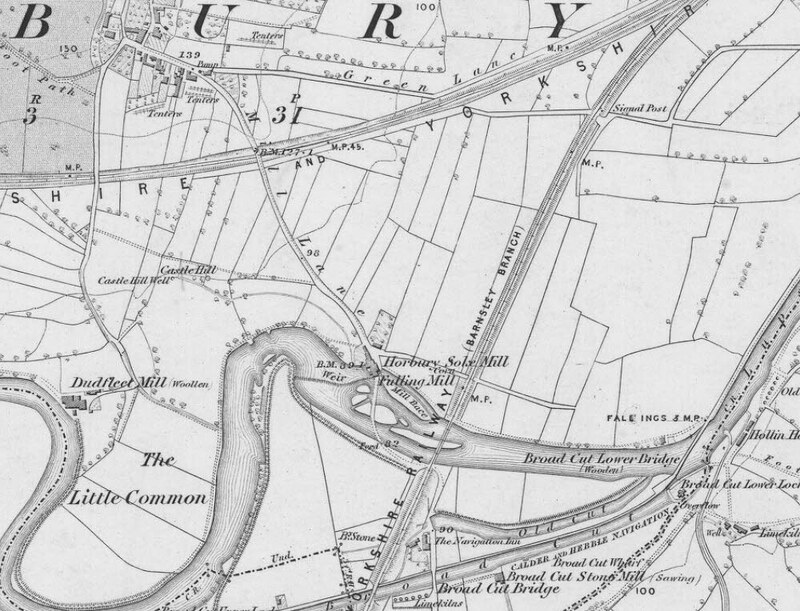 Above: An 1854 OS Map of Horbury Junction showing the Corn Mill or Soke Mill and the Fulling Mill before the arrival of heavy industry. The Soke Mill at Horbury Junction was used by villagers to grind the corn from their fields. The Lord of the Manor of Wakefield had from the earliest times maintained a soke mill at Horbury, one of three in the Wakefield area. Local people were bound by law to take their corn to the soke mill for grinding, giving a portion of the grain in payment to the Lord of the Manor. 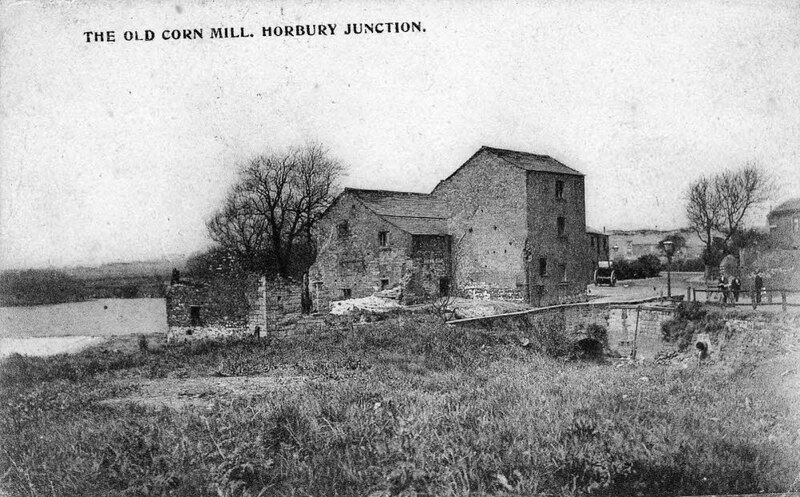 As the local population increased in Horbury, the soke mill at Horbury Junction didn't have the capacity to grind the quantity of corn required to make flour for bread. This led to the smuggling of flour, which was quite a common practice, although illegal, with most of the flour being brought ashore from ships at Hull. The flour was then sold in bags or in small quantities to the villagers in Horbury. However, it wasn't until 1852 that Wakefield (and Horbury) achieved freedom from this restriction by means of an Act of Parliament at a cost of £18,000, paid on the 1st June 1854. Above: The Horbury Soke Mill on the Calder at Horbury Junction. The mill was demolished in 1920/21. Picture courtesy of Neville Ashby and was originally a picture postcard dated April 27th 1909. "On land belonging to the late Mr. J.F. Carr of Carr Lodge, and situated near the Horbury Junction of the Lancashire and Yorkshire Railway, some workmen, upwards of twenty years ago, made some borings for coal, which lies there at considerable depth from the surface. When coal was reached, a rush of water came up from the bore-hole, and this rush has never ceased. An iron-pipe has been put down the borings, and up this pipe, which is only of small circumference, the water comes rapidly and flows down a dike to the river Calder. The idea of getting the coal was abandoned in consequence of the great quantity of water in the seam. The spring has now got the name of the "California Well." It is close to a footpath which leads from Horbury railway junction through some pleasant green fields to the village of Horbury, and is in Horbury township and close to Lupset Pasture. A Wakefield woman once asked me to take her a bottleful of water from the spring. She said she wanted it to cure sore eyes. I complied with her request and took her about half a gallon of the medicine. She used it, and it actually cured her. I have taken some of this water to my house and made tea of it. I can testify that it is good for this purpose. It brings out all the virtues of the tea leaves and the infusion, or rather the made tea, is a delicious drink. Horbury people frequently use the water for tea making as a treat, but say that it is too good to be used alone, and put some harder water to it. This water when cold is very pleasant to drink. It is as clear as crystal and has not got a particular sulphurous smell. It is good for scorbutic eruptions, relieves rheumatism, and is mildly purgative. It is antidotal to indigestion, and creates a healthy appetite, and yet with all these good recommendations, its flow is almost altogether allowed to run to waste. What portion of it, however, that is used, persons get without hindrance or molestation, without money and without price. When a light is held over the water as it comes up the pipe, sometimes there will be a slight flickering blaze but not to in any wise cause a bad impression against the spring. No doubt it is this gaseous element in the water which makes the use of this liquid so valuable." Above: The Ford over the river at Horbury Junction. 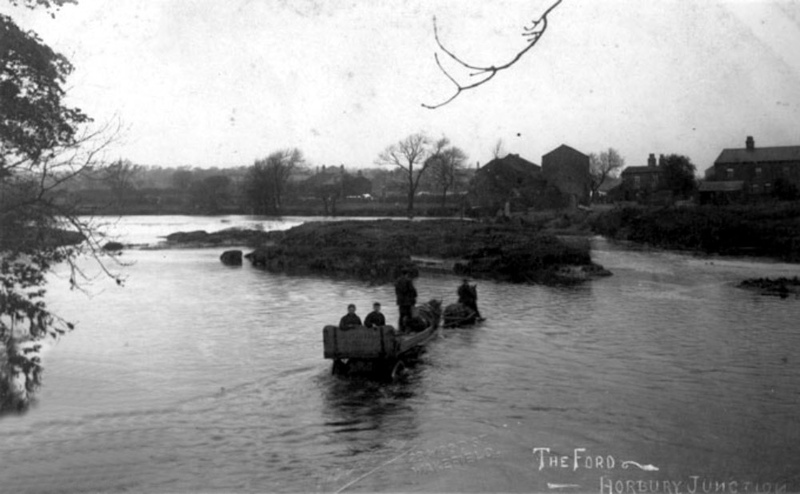 In 1897, a complaint was made to Horbury Urban District Council that the raising of the weir at Lupset for the Calder and Hebble canal had rendered the ford at Horbury Junction dangerous to use. By 1945, the Charles Roberts factory covered 45 acres, including the adjacent site of the Horbury Junction Ironworks Company, which Charles Roberts Ltd. had taken over in 1923 after the Ironworks business went into liquidation. They used the site of the old Ironworks business to build road passenger carrying vehicles. 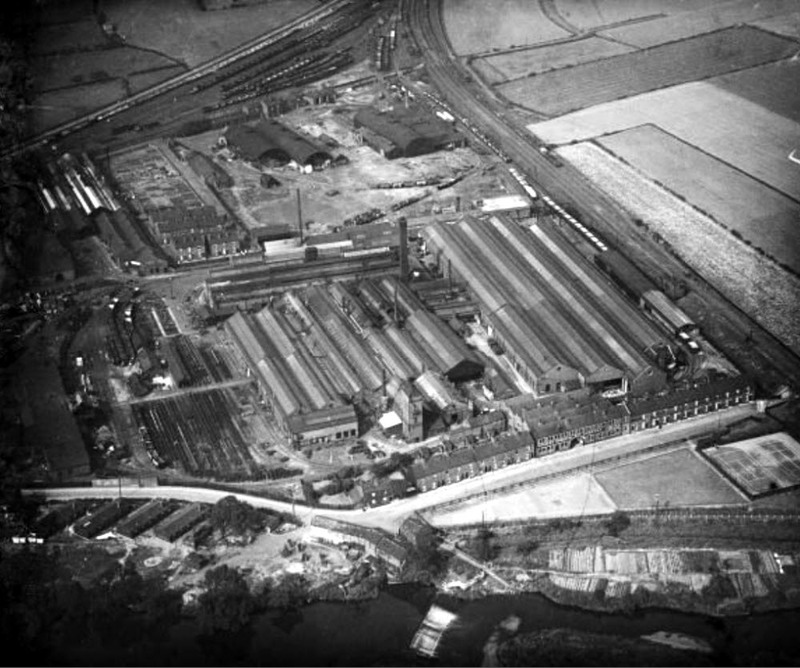 Above: Aerial view of the Charles Roberts Works in 1926. The site extended to some 43 acres. 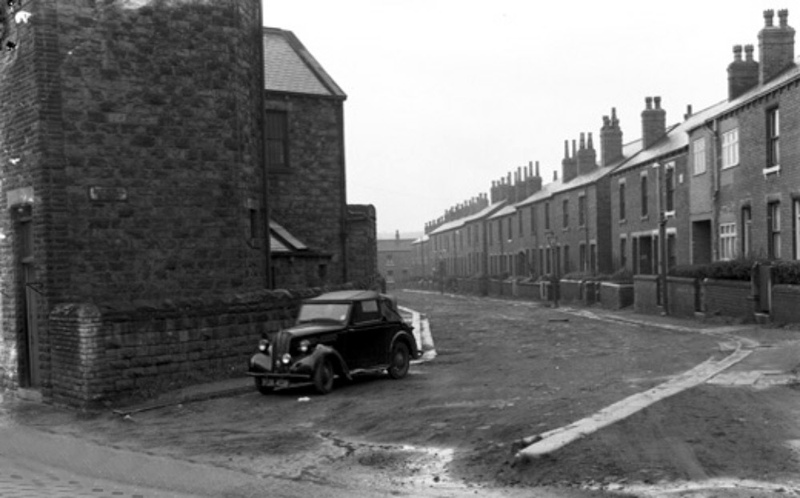 Above: Industrial Street, Horbury Junction in the 1950s. Built for the workers at Charles Roberts Wagon Works, most probably circa 1910. A row of houses at Charles Street, Horbury Junction were built for the work people at Charles Roberts at a cost of £151 each. They were eventually demolished and offices were built in their place for Charles Roberts' administrative staff. With the rapid growth of population at Horbury Junction with the expansion of industry in the area, an Anglican mission was established there to serve the local population. The Anglican Church still a strong following among the working class in the late 19th century and services were being held for men as early as 1887. However, a purpose built mission room was not established until 1887 that was open to all comers. The mission was very well patronised and as a result is was decided that a new church should be established at Horbury Junction to satisfy the demand. 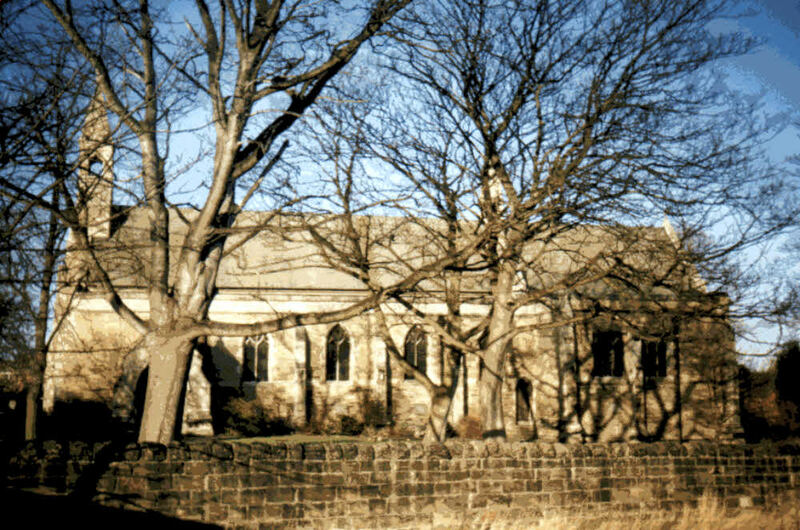 Above: St. Mary's Church, Horbury Junction. Photograph courtesy Guy Etchells. On the 10th October 1893, the new erected church of St. Mary the Virgin at Horbury Junction was consecrated by the Bishop of Wakefield in what was a recently formed ecclesiastical district, of which the Rev. H.R. Manders was the first incumbent. The church was built by Franklins of Deddington at a cost of £6,116, nearly all of which was raised by public subscription from the people of Horbury Junction. The Anglican vicar of Horbury, the Rev. John Sharp chose George Frederick Bodley and his partner Thomas Garner, two of the foremost church architects of the Victorian era to design St. Mary's. Eminent stained glass artist Charles Eamer Kempe was chosen to design and construct the stained glass windows. Described by Bodley as "of the 14th century, entirely English in its character", the church consisted chancel, nave, and two aisles with an organ chamber and vestries. A small morning chapel had been built at the eastern end of the southern aisle specifically for services where the congregation was small. After the church was opened, the old mission room was used instead as a parish hall for social engagements. Fund raising continued in order to raise money for a new parish hall, an organ for the church and also to establish a school. The organ was installed in 1905 and the new parish hall was started in August 1908 when Mrs. Milnes-Gaskell laid the foundation stone. Major structural work was carried out in 1926 when it was found the chancel arch of the Church was showing signs of movement. In fact, the church had been poorly built and suffered from the use of defective building materials and poor workmanship by Franklins, and major restoration was necessary just 33 years after the church opened. The size of the chapel was doubled. The work was done by a local craftsman, William Thickett. There was a major fundraising campaign in the early 1950s which paid for the replacement of the roof over the nave, under the leadership of the then Vicar, A. S. Jackson. The present vicarage was completed in 1956 and cost about £6,000. St Mary’s was awarded Listed Building status (Grade 2) in 1966. The Methodists (or non-conformists) also became concerned about the spiritual and social welfare of the working people of Horbury Junction. As early as 1878, the Wesleyan Methodists had established a mission room. The mission was a huge success and larger premises were soon needed. In 1887, a Gothic Wesleyan Chapel was built at the corner of Forge Lane. The last service was held there in 1969 and the handsome chapel was demolished in 1971 as a result of reduced number of people attending the chapel and the high cost essential building maintenance work making the chapel no longer viable. In 1878, a school was established in Forge Lane, behind the Wesleyan Chapel. It closed in 1913 when the children were transferred to the new Council School on Northfield Lane. 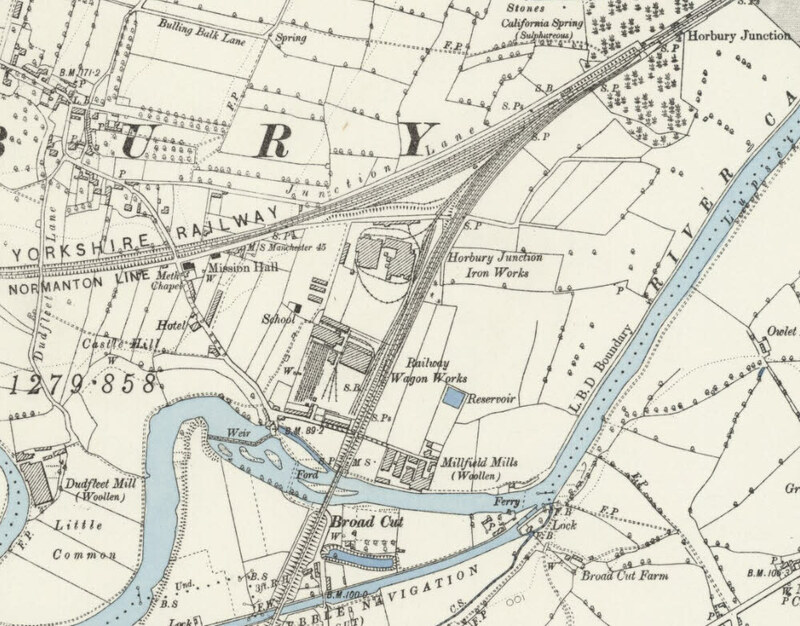 Above: 1894 map showing the major industries at Horbury Junction. Horbury Lagoons were developed from sand and gravel pits that were excavated between WW1 and WW2. Horbury Urban District Council paid £2,750 for the sand quarries to provide refuse tipping facilities for 100 years. The area included 27 acres of water. The gravel extraction was operated in the 1940s and 50s by Whitaker's Sand and Gravel Company. The lagoons have been used at one time by the Charles Roberts and Co. Sailing Club, Wakefield Tradesmen's Angling Club, Wakefield Model Boat Club and one lake is leased in 2016 by the Wakefield Angling Club for coarse fishing. The lagoons were cut completely in two by the construction of the M1 motorway. 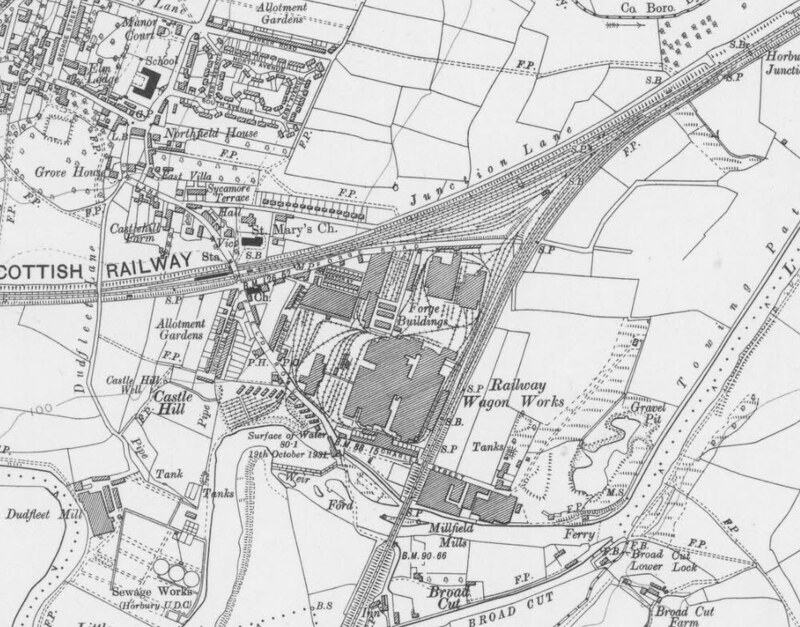 Above: 1930 map of Horbury Junction with more industrial development and more houses for the workers and their families with the arrival of Industrial Street and Prospect Street. The first of the gravel pits is shown for the first time on this map. Millfield Mill at Horbury Junction was built in the 1870s and began as Ward's Mill. In the mill's heyday cloth was produced for police uniforms. Later, the mill made indigo, dark green and red cloth for the Government. It was later taken over by Archer, Ritchie and Co., cloth manufacturers, who also owned nearby Dudfleet Mill. Archer, Ritchie and Co. was formed in May 1878, after the death of Abram Archer, in a new partnership between Henry Ritchie and John William Archer of Ossett. The company also at that time operated Spring Mill in Ossett. On the 25th October 1890, during the ownership of Archer, Ritchie and Co., a fire destroyed the large four-storey Millfield Mill with damage estimated at £20,000, which was a huge sum in those days. In later years, Millfield Mill was bought by Messrs. Fenton and Co. Eventually, the business failed and was taken over by a bank acting as liquidators. Millfield Mill finally closed circa 1918. The approach to Millfield Mill, which can be seen on the map above, was along the side of the river Calder from Charles Street. When the mill was closed and then demolished, some of the recovered materials were used to build St. George's Church in Lupset, Wakefield. It was reported that during demolition, some of the contractors sieved the dry soil underneath the floors of the old mill and where the counting house stood, they found several gold sovereigns, half sovereigns and coppers that had fallen through the floorboards. When the mill was being demolished circa 1949, one weekend, thieves somehow stole a steam crane with a 100ft long jib that was set on 12ft high concrete pedestals. The crane had been used to load and unload barges bringing materials to the mill when it was working. 1. "Leeds Mercury", 21st May 1881. 5. "Some Horbury Yesterdays" by R.D. Woodhall, first published in 1973. 6. "Proud Village - A History of Horbury in the County of Yorkshire" by R.L. Arundale, reprinted 2003 Horbury Historical Society.